TOFU MOM . . . and gravy! 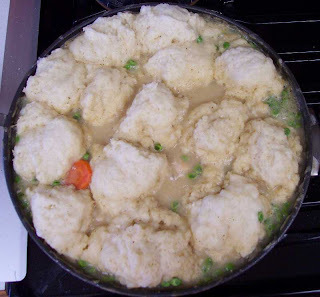 : Vegan Chicken And Dumplings; Ultimate Comfort Food! Vegan Chicken And Dumplings; Ultimate Comfort Food! This is my "veganized" version of a decades-old "Grandma" recipe. I've included lots of variations and notes because I've made this so many times and yet, almost every time I seem to tweak it just slightly different. The basic recipe remains the same however. Don't be put off by all the ingredients, the end result is well worth it and the ingredients are all pretty basic. 1/2 cup white wine - the kind you drink, not "cooking wine". **also optional but tasty, sliced mushrooms that have been lightly sauteed. Put the chicken, broth, wine, cloves and bay leaves in a 4 to 5-quart stock pot with a tight-fitting lid. Simmer gently, partially covered, for 10 min or so while prepping veggies. Transfer the chicken to a plate or bowl. Let stand until cool. Strain the cooking liquid into a bowl. Melt the margarine in the stockpot. Add the onion and if you're using the optional fresh mushrooms, you can add them here too. Stir and cook over high heat for 3 - 4 minutes. Stir in the garlic and herbs; cook for 1 more minute. Stir in the flour and pepper and cook for 1–2 minutes, stirring constantly. Add the reserved broth that you cooked the chicken in. Bring to a simmer, stirring constantly, to make a smooth, thin sauce. Add the potatoes, carrots and celery to the sauce. Stir in the peas and parsley and chopped fresh greens if you're using them. Cover and bring to a boil over medium heat then reduce the heat to a simmer. For the dumplings, mix the flour, baking powder and salt in a large bowl. Using your fingers, work in the shortening/coconut oil until the mixture is crumbly. Make a well in the center and pour in the soymilk/lemon juice mixture. Add the chives or parsley. Stir quickly with a fork until the ingredients are just mixed. Using a tablespoon, drop the batter into the broth/gravy to make 16 small dumplings, leaving space between them. Sometimes when I'm feeling all Martha Stewart-ish, I shape them by hand a little so they aren't so rough. Cover the pot and simmer, (over as low a flame as possible) without lifting lid, stirring or disturbing, for 15–20 minutes. Spoon into bowls. Make sure every serving gets chicken, veggies, gravy and dumplings. My Grandma's recipe says "Serve at once." What?? Like we're going to wait around at this point?? Garnish with parsley or chives if you want. I LOVE those Mstar Farms chik'n strips! They sub in great in my mom's chicken and rice casserole dish. We could all use soem comfort food in mid-Feb.
mmm, ultimate comfort food indeed!! what a delicious twist on an old classic. Mmm, this looks really good. By the way, thanks for the comment on my blog (Vegan Talk). I've added your blog to my vegan blogroll. nothing better than comfort food. with my broken arm, i could use some! I haven't made chicken n dumplings in a long long time. It's always a hit and yours look so good. I stumbled across your recipe a couple of days ago and knew I had to make it. Well I did today and it was sooooo amazing!!! It tasted better than any chicken and dumplings I can remember having pre-vegan. Thank you so much for sharing! My man made these and nearly vomited. What's up with the starchy broth? This sounds wonderful! Since I have been vegan I have only made the recipe from Vegan Soul Kitchen which uses tempeh and cornmeal dumplings. I'm happy to see a more traditional version of this recipe! My only concern before making this is what the guy above me hinted at. I find when you don't use eggs for this sort of thing, if you boil the dumplings in the soup broth, doesn't the "gravy" get all chalky?? If not, what's your secret?? Except for the one above, I've never had a complaint about this recipe, and I've published it on many forums, websites, etc. If the directions are followed as written, the dumplings turn out great. Eggs aren't necessarily needed to hold things together, i.e. pasta, bread, cakes, pastries, custards, all of these can be made without eggs. You will note; It doesn't say "boil" the dumplings, but simmer on VERY low. Good luck, let me know how they turn out!